Lucy and Ethel can't wait to get a closer look at the O'Brien's (new neighbors in the building) belongings, but Ricky makes Lucy promise "not to set foot" in their apartment. Next day, she crawls in ("he didn't say I couldn't set knees in"), along with Ethel, to snoop. When the curious pair hear the O'Briens approaching, Lucy quickly hides in the closet. 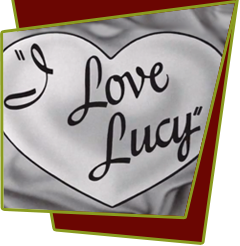 Not realizing the couple are actors rehearsing a play, Lucy jumps to the conclusion that they're going to "do away with the tenants on the upper floor and assume their identities to blow up the Capitol." Panicked, Lucy dons a slipcover, disguising herself as an armchair, and slowly makes her way out of the O'Brien household. Lucy alerts Sergeant Morton, who thinks she's crazy; then barricades their apartment door and takes up arms with Ricky and the Mertzes. The foursome wind up in jail after nearly blowing off the police sergeant's head and Ricky is despondent over the headlines "Orchestra Leader jailed in Shooting Spree." Special Notes: K.T. Steven and her actor husband, Hugh Marlowe, were among Vivian Vance's closes friends. Bloopers: When the sergeant starts to walk to the jail cell, it's obvious he's starting from the edge of the set as there is nothing else there, not a hallway, desk, etc. And as he walks the few feet to the jail cell, the camera shadow covers him and the set wall behind him.